A panel presentation is scheduled to offer information to families about how students and children function in an online world. “Stop, Think Connect: Online Safety & Digital Citizenship” will answer the questions of what students are doing online and discuss the topics of digital citizenship, online privacy, cyberbullying and more. Students are welcome to attend. The event will take place at 6 p.m. Monday June 6 at the Forsythe Middle School Media Center, 1655 Newport Road, west of Main Street, north of Summit Street. This panel presentation is sponsored by the Ann Arbor Public Schools, the Washtenaw Area Council for Children and the Ann Arbor Police Department. E-mail Director of Instructional Techbnology Monique Uzelac with any questions. Two Ann Arbor Public Schools staff members received Celebration of Excellence awards at the May 25 Board of Education meeting. Huron High School business teacher Christy Garrett was nominated by co-worker Diane Stocker-Bendersky and Ann Arbor Open teacher Mike Derhammer was nominated by parents Annie Rubin, Angie Smith and Laurie Krauth. Both were awarded for excellence in outstanding customer service. Garrett was nominated for her excellence in teaching and her “zest in preparing students to compete and win consistently” in business competition and for bringing the real world to the classroom. “She is the type of teacher that demands excellence and pulls brilliance from each student she works with,” according to her nomination. In addition to an after-school math club, he hosts a barbecue to celebrate his graduating sixth-graders, organizes a parent Euchre night and invites former students who are now in middle school to come back to his class to talk to sixth graders about what to expect. He also involves his students in community service projects. These college-bound seniors represent 14 of the program’s 16 graduating seniors. Clemente students graduate from their home high schools. Jasper Lindsay brought home second place for the Softball Throw and Wheelchair Obstacle Course and first Place for the Wheelchair Race event. Ean Neville brought home third Place for the Softball Throw and 100 M dash and second Place for the Standing Long Jump. Grace Pearson took home first Place in the Softball Throw, 50 M Wheelchair dash and Wheelchair Obstacle Course. Jared Whitfield took home third place in the 100 M Wheelchair Dash, second Place in the Wheelchair Obstacle Course and first Place in the Softball Throw. WAY Washtenaw, a program to help high school students achieve their educational goals and earn a high school diploma, is hosting an informational night will on Tuesday, June 14 from 5-6:30 p.m. at the Washtenaw Intermediate School District offices, 1819 S Wagner Road, Scio Township. WAY Washtenaw uses technology to reinforce learning while working with a qualified teacher and one-on-one mentor, 365 days a year. The program is designed for students who have dropped out of school, are at risk of dropping out of school, or are not on track to graduate. The Ann Arbor PTO Thrift Shop donated more than $101,000 to the Ann Arbor Public Schools for the Ann Arbor PTO Thrift Shop Transportation Fund in the 2010-11 school year. The shop also supports AAPS Educational Foundation as well as additional end-of-year contributions to the district. The PTO Thrift Shop is a nonprofit, community-based resale store featuring gently-used everyday items, unique treasures, and more. The shop has a special connection to families and to the district. All shop profits go toward Ann Arbor Public Schools and students. Visit the store at 2280 S. Industrial Hwy., Ann Arbor or online at www.a2ptothriftshop.org. They can be reached by phone at 734-996-9155. The Ann Arbor District Library will launch its annual Summer Reading Program during the Taste of Ann Arbor event. The preview launch takes place from 11 a.m. to 5 p.m. Sunday, June 5. Visit the Library booth (on Liberty Street between Main Street and Fourth Avenue) at Taste of Ann Arbor as the Ann Arbor District Library spreads the word about the Summer Reading Game. Maggie Lemak, a 15-year-old Pioneer High School freshman, picked up a paintbrush one day during summer vacation and let her happy mood come out in bright‐colored pictures of flowers. Her style caught the eye of Sarah Nicoli, cofounder of dotmine day planners. 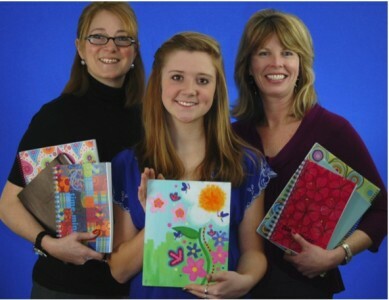 Maggie Lemak, center, with the artwork she created that will be featured on the cover of a 2012 time.mine day planner through dotmine day planners. Pictured with her are dotmine co-founders Lisa Edwards, left, and Sarah Nicoli. Lemak’s artwork will grace the cover of a 2012 time.mine day planner, according to information from the company. Geared to students in middle school through college, the planner starts this August and goes through December 2012.